When I think of puppyhood, I think of one image: the time I came home from lunch to walk my Frenchie puppy and found that he had somehow escaped out of his crate in our teeny, tiny apartment. The floor was covered in shreds of paper and cardboard, a ceramic vase was lying on the floor broken (with possibly a bite taken out of it?! ), a lamp was knocked askew, there was pee inside a shopping bag and, as I took in the chaos of it all, a tiny puppy barked at me and chomped at my shoe. Welcome to puppyhood. Raising a puppy is full of ups and downs, quiet, sweet moments and moments of patience testing. As you don’t need any advice on how to fall in love with a puppy, let’s talk about what to do during the moments your puppy is acting a little less cute. A pupping chewing on a shoe. Photography ©alkir | Thinkstock. Peeing is inevitable. Accidents will happen, and in some instances you might find yourself thinking this doesn’t feel that much like an accident. You will walk around for what seems like hours outside, and your puppy will inevitably pee the moment you step back in your door. You will find mysterious wet spots on your rug, behind a couch and in places you don’t remember allowing your puppy to be. Training your puppy not to pee everywhere: Crate training is truly a miracle gift; embrace it. Your dog will not want to do her business where she sleeps and eats. Keep a schedule. Take her outside regularly, especially after food and water time. Limit playtime to short intervals and also limit the amount of space she has to play in indoors. It’s easy for a puppy to get distracted and forget she has to go. You’re the adult here, so keep track! Carry your puppy from the crate or food dish to the outdoors. Give her every opportunity to succeed. Human babies wear diapers for years, so try to keep a perspective on how amazing your puppy is for having any kind of understanding of where to pee. 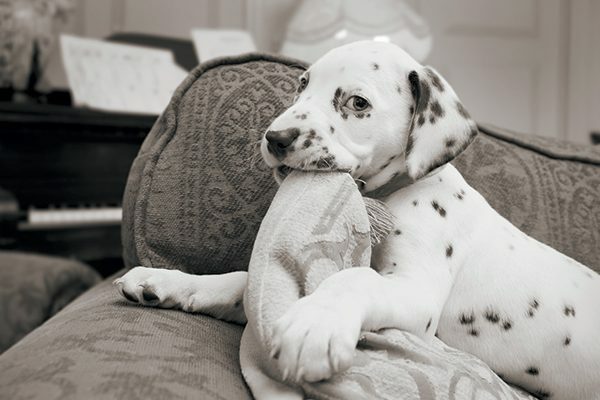 A puppy chewing on a couch. Photography ©Sunshine_butterfly/Shutterstock. Puppies explore the world through their mouths, and as those tiny little blades of glory are growing in, they will want to explore equally with their teeth. You will look around your house and wonder how you never knew everything in your home was so delicious. Training your puppy not to chew everything in sight: This is just a phase, and it will end, so help your puppy get through it. Limit where she can go and what furniture she can access. Your puppy can’t chew what she can’t reach. Provide lots of interesting and different toys for her to chew on and play with. Frozen towels are a great item for teething puppies, and if you want to up the game, fill the towels with food or treats before freezing. A puppy chewing on a pant leg. Photography ©Chris Mueller | Thinkstock. Remember when I said puppies like to explore the world with their mouths? You may have already noticed that this includes you. Puppies do everything with their mouths: eat, play and chew on your valuables — I mean approved toys. It’s just part of being a puppy, but it doesn’t mean you want teeth marks on your leg. Training your puppy not to nip: Stay calm. It’s easy to have a negative reaction when someone is chewing on your arm, but the best thing you can do is stay calm and make a quick yelping noise. This is what would happen if they bit another puppy, and it’s how they learn what is too much. Pushing your puppy away or yelling will make her think you’re playing, which encourages the behavior. If your puppy is regularly using you as a chew toy, it also might be time to get new toys or refresh some of the ones you have. If your puppy is biting you, offer her another toy as a distraction. Puppies have tons of energy and only two speeds: on and off. As your puppy grows, you will find the “off” time dwindling as the “on” time gets more involved. Training your puppy to behave: Give your puppy lots of exercise in the form of walks and playtime. If that doesn’t seem like enough, get toys that require her to use her brain, and enroll her in a basic training class to get her mind working. A tired dog is a well-behaved dog — and a happy one, too. Remember that puppies are just babies, learning how to explore and live in a world with very different rules than what they are used to, and they are more than happy to oblige when it comes to trying things out. When you find yourself getting discouraged or frustrated, the best thing to do is remember that puppyhood isn’t forever. Enjoy it while you can with all it has to offer. You’ll look back at the good with fond memories and the less good with laughter over everything you went through together. Thumbnail: Photography ©Aimes Element | Thinkstock. 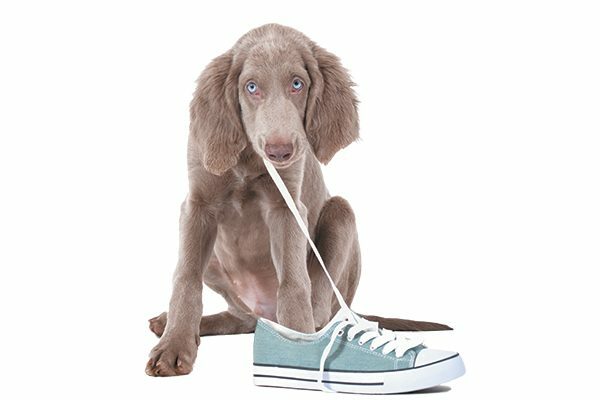 The post Training Your Puppy and Dealing with Puppy Problems appeared first on Dogster.